Pitt bull abused in dogfight. (Maywood, IL) – July 17, 2010. Governor Pat Quinn on Saturday signed a bill that added teeth to state law to deter organized dogfights by imposing harsher criminal penalties for dog-fighting offenses. 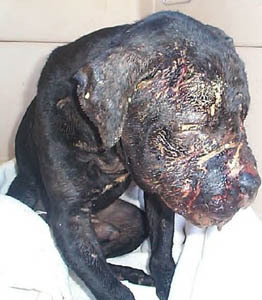 The United States Humane Society estimates that more than 40,000 people across the country buy and sell fighting dogs and are involved in dogfighting activities. But authorities say those in dogfight circles also are involved in a number of other crimes, including narcotics trafficking, illegal gambling and murder. Chicago Sun-Times reporter Steve Malanga wrote in 2007 that an analysis during a study by the College of Law at Michigan State University found that, in more than two dozen raids on dogfights, in virtually every instance police also seized illegal narcotics and weapons. On February 19, 2010, Elgin police raided a home, that was being used as an indoor marijuana farm, across the street from a middle school, and discovered 21 vicious pit bulls that were being trained for dogfights. Officers said that when the dogs began attacking them and each other, police shot six of them to death and trapped the other 15. The man who lived at the home, 37-year-old Alejandro Campos-Rivera, was charged with unlawful production of cannabis plants, a class 2 felony, and aggravated animal cruelty, a class 4 felony. “We knew that he had pit bulls, so we brought along animal control officers, hoping we’d be able to capture them safely with nooses,” Elgin Deputy Police Chief Jeff Swoboda said. “But there turned out to be 21 of them, and they were extremely aggressive. Some broke out of their cages and had to be shot. Under the new law, House Bill 5790, Sponsored by State Rep. Karen Yarbrough (D-Broadview) and State Senator Kimberly Lightford (D-Westchester),will inflect more severe penalties for dog fighting show or related activity. For example, anyone found guilty of holding a dog fighting show within 1,000 feet of a school, public park or playground, or other facility that provides programs or services to children under 18 years old will now be punished with a Class 3 felony for a first violation and a Class 2 felony for a subsequent violation. Because there are reliable statistics on dog fighting, the nation’s first criminal dog-fighting DNA database was announced on June 15, 210 by the American Society for the Prevention of Cruelty to Animals, The Humane Society of Missouri and the Louisiana SPCA to be maintained at the University of California, Davis Veterinary Genetics Laboratory. “This database is an unprecedented and vital component in the fight against animal cruelty and will allow us to strengthen cases against animal abusers and seek justice for their victims,” said Tim Rickey, the ASPCA’s Senior Director of Field Investigation and Response. The new law signed by Quinn goes into effect on January 1, 2011.